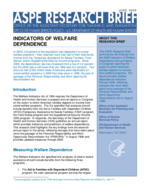 This ASPE Research Brief summarizes the findings from the 2008 Indicators of Welfare Dependence Annual Report to Congress reporting the extent to which American families depend on income from welfare programs. The report provides welfare dependence indicators through 2006, reflecting changes that have taken place since passage of the Personal Responsibility and Work Opportunity Reconciliation Act in August 1996. In 2005, 3.8 percent of the population was dependent on social welfare programs — they received more than half of their total family income from the Temporary Assistance for Needy Families, Food Stamp, and/or Supplemental Security Income programs. Since 2000, the dependency rate has increased from a low of 3.0 percent but the 2005 rate is still lower than the 1996 rate (5.2 percent). Two and one half (2.59) million fewer Americans were dependent on social welfare programs in 2005 than they were in 1996, the year of passage of the Personal Responsibility and Work Opportunity Reconciliation Act.